21st May 2018 Colombo Sri Lanka: Aditya, the all-suite luxury boutique resort sitting on the golden beaches of Rathgama and which has since 2005 carved an impressive niche in the Sri Lanka resort landscape, celebrated yet another milestone when it won four TripAdvisor Travellers’ Choice Awards in 2018. Sitting amongst some of the most unique properties that have each crafted its own personality and identity, Aditya, which denotes the solar deity, shone brilliantly in four very competitive categories. Named among the Top Ten Luxury Hotels in Sri Lanka, Aditya also holds the honour roll among the Top 25 Small Hotels in Sri Lanka and gained TripAdvisor kudos for being among the Top 25 Hotels in Sri Lanka for Service as well as the Top 25 Hotels in Sri Lanka for Romance. Renowned for its chic contemporary design which maximises on the spectacular panorama of the Indian Ocean, interiors that narrate understated elegance with its surfeit of Balinese and Sri Lankan antiques and vignettes that are cultural hallmarks of down south life like the Ambalangoda masks set against polished cement floors and tropical hued upholstery, Aditya plays on the super-luxury of open spaces, unending seascapes and tropical vistas. Called a ‘true secret gem’ by travel writer Philip Worman, each of the twelve suites and two newest villas give luxury a new definition: extravagance combining absolute comfort and indulgence prompting ultimate relaxation. The two new villas are probably the country’s largest stand-alone double roomed spaces being offered in the hospitality industry. Each approximately 7,500 square feet, the villas are expansively spacious and epitomise the quintessence of luxury that Aditya has now made its brand promise. 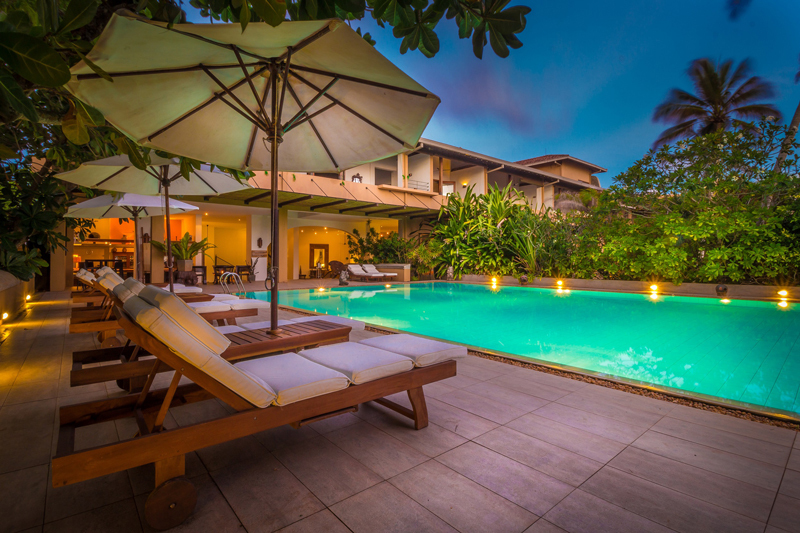 These villas could be booked as a single roomed suite with its 30’x12’ lap pool set within a secluded garden or as the entire villa, which gives access to both the lap pool on the ground floor and the rooftop jacuzzi. The beautifully appointed lounge and bedrooms are spared nothing in the realms of lavish comfort, with attention to detail being Aditya’s signature well seen in these villas as well. These levels of service are undeniably taken to higher realms as Aditya’s F&B stands a notch above the rest, with meal times being flexible, a delectable breakfast, lunch and dinner a la carte or from a set menu accompanied by a host of cocktails that will enthuse even the most critical gourmand. Each dish gets the personalised touch of Aditya’s Master Chef guaranteeing a dining experience that’s scrumptiously delightful. Add the aspect of a dinner for two, romancing by candlelight while seated on the golden beach to the soft sounds of lapping waves, a spa treatment for two or even better, a romantic interlude in the open air plunge pool or jacuzzi that’s a feature in every suite and Aditya well deserves its spot among the Top 25 Hotels for Romance in Sri Lanka.